One of the outcomes of this project, so far, is that people have started to give me their own fabric–some very generous gifts, most often pieces they acquired for projects they intended to make, themselves, or are passing on from someone else they inherited it from. All of these, so far, have been rather beautiful fabrics. They’re the kinds of fabric people hold on to for a long time–other more day-to-day fabric supplies can be passed on, sold at yard sales or handed to thrift stores, but many sewers have special pieces they keep close, with full intentions of completing a project, some day. It is these extra-special pieces that now find their way to my fortunate hands. In my mind, these bring with them their own special requirements. If someone has been holding on to a piece of cloth for years, after all, then surely they have spent those years imagining it as something beautiful. It feels like an additional responsibility: to do the fabric proud, to live up to not only my own expectations for it, but also the expectations of the person (or whole lineage of people) who passed the cloth along the line. After all, if they’ve now decided to give it to me, it implies trust: a trust that I will be able to make of it what the cloth’s previous owners did not. 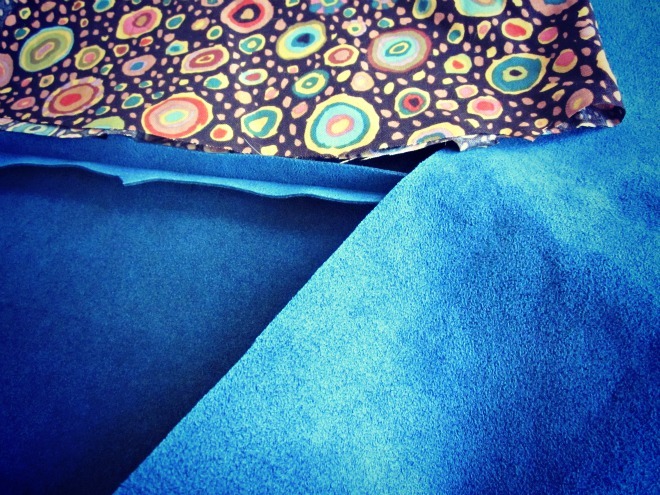 The piece of “entrusted” fabric that I am working with, today, is an electric blue ultrasuede. I’ve never sewed with ultrasuede, before, but I simply love the color of this, and want to do it proud. You are so right. I have made nice pieces out of fabric given to me that the original owner couldn’t do anything with. I always make sure I do a really good job of using their fabric too. That blue suede looks fabulous — one of my favorite colors. Anxious to see how that one comes out. You’re gonna look great.